Asus Zenfone 3 ZE520KL Review: If It Wasn't For The Glass Back. For the past few years, Asus has been ruling the mid-range market in India with their Zenfone Series. Affordability and Solid Performance could be the perfect expression for the sentence that I mentioned above. The consumers have widely accepted the Company in India & I've personally seen people buying their Smartphones on top of few Chinese brands. So to step up their game, This year Asus completely refreshed their design language after almost two years. The new polished design has got premium looks & So does it add a premium price tag. You guessed it correctly; I'm talking about the new Zenfone 3 series. Probably the most impressive set of devices Asus has ever launched, The devices that received a lot of hatred comments from the internet just because of the hefty price tag. Yes, I felt the same when it got launched considering the price. But after using the Zenfone 3(Base Model) for more than two weeks, I might have a change of thoughts on that perception. So I would like to ask you, viewers, Does Quality matters or the Price Tag? Let's find that out in my in-depth Asus Zenfone 3 review. So the new Zenfone 3(ZE520KL Variant) comes with Qualcomm's Snapdragon 625 Octacore Chipset which comprises of a 64-bit CPU architecture clocked at 2Ghz. Blooming that is the Adreno 506 GPU coupled with 3GB RAM. 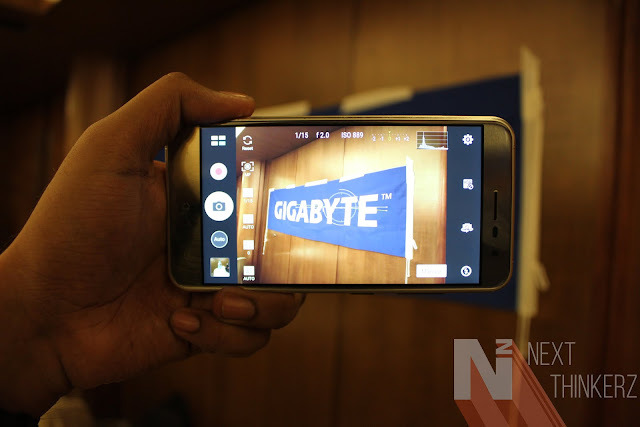 It has a 32GB Internal Storage & Expansion is available up to a whopping 256GB via a MicroSD memory card. But those are the numbers, Numbers that most of us live by judging immediately the fact that another competitor is offering a better processor at the similar pricing. I get it; It's correct but only for certain areas. Regarding performance, The Zenfone 3 unit is received for review purposes was performing like a breeze. App load times, Switching between the apps, Keeping the minimized app in memory and resuming it from where you left, Everything was just absolutely perfect. The processor didn't give me a hard time while playing heavy/intensive games and I got decent if not smooth gameplay considering frame rates in mind. The best part of all was that the Zenfone 3 didn't heat up while playing games, Which is kind of interesting for a device having a Snapdragon 625 chipset. Also when it comes to the Audio Performance, Zenfone 3 performs like a champ here. The single bottom firing speakers are quite loud, and there's also an option to trigger outdoor mode while you're out in the wild, but get ready for some distortion. Though that distortion wouldn't be noticed in an outdoor environment. This has to be probably the most important change that Asus has implemented in their newer devices. Frankly speaking, The Design resonates a premium appeal, when held in hand. Both the front and the back panel are glass coated, Whereas the center part consists of aluminum metal. The 2.5D Curved Glass blends in the edges providing an overall smooth grip with no sharp corners. Whereas remember the ugly antenna lines on most of the competitor devices? Asus has smartly incorporated these on to the top and bottom of the Zenfone 3, Good Job Asus. The 5.2 inch device feels great in hand, but the glass back will give you a hard time holding it firmly. Almost 6/10 it slipped from my hand, and When kept on any solid surface which isn't flat that number increases. The Glass back along with slipperiness also introduces a significant of fingerprint smudges all over the back panel of the device. No matter how much you clean it with a proper cloth, It'll grab smudges the moment you hold it in your hand. So make sure to grab a Skin or a Sandstone Case for having a proper grip over this device. Tip: Don't go for the Shimmer Gold/Black color variant opt for Moonlight White or Aqua Blue color. Moving on to the next topic that I don't like is the massive Camera Sensor bump. I totally understand that a lot is going inside that sensor, which has Quality optics and OIS Capabilities, I don't have any problems with that. The thing which I hate the most is that the Brands are willingly heading on the path for creating Thinnest & Lightest devices considering the competition, Gently Coughs. This is primarily the reason why Small size chassis inhibits a small capacity battery. But Asus has managed to cramp in a 2650 mAh battery, and it doesn't provide a great backup in my opinion. It would've been great to see that the company might have filled that bump with an overall flat design housing a larger battery, Though Asus claims that the Camera sensor won't get any scratches due to the Sapphire lens onboard. 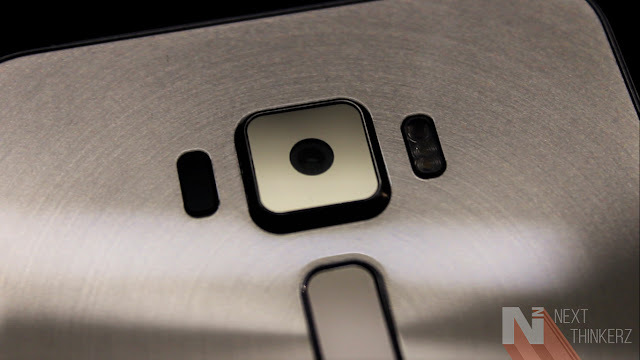 Whereas just below the Camera Sensor lies the Fingerprint Scanner. This is a perfect placement for the fingerprint sensor in my opinion, but I would've Loved if it was present in a circular shape rather than the rectangular shape. Being said that There aren't any issues with the scanning; The Fingerprint Scanner works as it should almost 90-95% of the times concerning accuracy. Fun Fact: Good to see the Asus Logo imprinted inside the glass panel on the back, As previously on my Zenfone Max, the Official logo got wiped out within a month of Usage. So Yes, they do listen to your feedback. Considering the first element in this department would be the beautiful 5.2 inch IPS LCD(1080p) Full HD Screen which provides ample amount of brightness and keeps the same fact accurate when used in direct sunlight. Everything from the viewing angles, Color saturation or reproduction was quite beautiful, and I enjoyed this part. I feel 5.2 inch is a perfect display size for any Smartphone, But that's just me. If you're not satisfied with the color accuracy on the Zenfone 3, You can tweak that in the display settings. Also if you're a night reader, the Bluelight filter might come in handy. I thought with the new Design; Asus might change their faults in the front part too. But that didn't happen, If you haven't guessed it yet, I'm speaking about the Front Capacitive buttons. Yes, Zenfone 3 doesn't have backlit keys again just like every other Zenfone. The only way to ignore incorrect inputs during the night is to turn on One-Handed Mode because that's how On-Screen buttons pop up. Well, I won't concentrate the fact that it has a bump Because the Camera is just flawless. I'm totally in love with its performance in outdoor conditions. OIS(Optical Image Stabilization) together with EIS(Electronic Image Stabilization) help in creating a great stable shot. On the Rear, it has got a 16MP Camera(Sony's IMX298 Sensor) having F/2.0 Aperture, 6P Element Lens accompanied by TriTech Autofocus mechanism made of 2nd Gen Laser Autofocus system. Keeping the numbers aside, Focusing is wickedly quick, and Asus claims that the subject gets focused under 0.03 secs. TriTech mechanism helps in snapping quick photos, But the photos that you click in 16:9 Aspect ratio are limited to 12MP shots. But you can always take the full potential of the sensor by tweaking that into settings, But do keep a note that the 16MP shots would be snapped in 4:3 Ratio. Though there are a plethora of modes available within the camera app. It's good to see that Asus has updated their Stock Camera App and made it cleaner. The Rear Camera takes excellent shots having the right amount of details concerning saturation and colors seem on the natural side. But that sentence gets a little bent in low lighting conditions, Sure the OIS steps in, to take a decent amount of details in low light but it isn't the best that I've seen so far. But Night mode can help you in getting a good shot without tweaking much. One of the great things that I've observed with the Manual Mode is that You can play with the settings to obtain a delightful shot in possibly any lighting conditions. Knowing the right tricks in the Manual Mode(So called DSLR controls) for tuning the Shutter speed, ISO, White Balance and Manual Focus can be pretty handy in many situations, But I'm pretty sure you won't use it Unless you're a Geek. Most of us would be satisfied by the Auto mode itself and won't even bother to head into camera modes. Most of the Modes are just gimmicks rather than being of actual use. Also, the Super Resolution mode manages to take a better picture, Due to the photo stitching technique.As some of you might know that several shots get clicked in this mode and these shots are then stitched automatically to get a 60MP shot. I'll add some images below so that you can have a gradual idea about the same. The Rear Camera is also capable of recording 4K at 30 FPS which is great in my opinion as the footage looks very Crispy, But make sure you're steady while shooting one. As the OIS does not have support for 4K Video, It's available only from 1080P Videos & Downwards. But don't worry EIS takes part while recording 4K and This helps the camera sensor in staying calm. Just so you know, Since OIS doesn't play a part while recording 4K, The Sensor doesn't heat up much. As we've seen many flagships facing that issue recently. A quick point to mention would be that 4K isn't yet the standard resolution at least in India, So most of us won't be bothered by it, Unless and until you're a content creator. Awesome Fact: When the Dual LED Flash is turned on, It lights up the entire 2.5D curved edge on the backside giving it a ring flash type appeal. That looks wickedly awesome. When it comes to selfies, The Front Camera being an 8MP shooter which performs a decent job. It's not terrible or great; It's subtle enough when it comes to sharpness. When the lights get dim, An enormous amount of grain gets observed from the front camera. Whereas If you get this device make sure you turn OFF the beauty mode, As it's turned ON by default. Beauty filter just softens the image, and the photos look artificial rather than being natural in my opinion. The Front Camera also gets plenty of modes, But again most of you won't bother about those. When it comes to videos, It shoots in 1080p Full HD resolution. So the User Interface on the Zenfone 3 looks clean than the previous skins of the Zen UI. The Zen UI 3.0 is built on top of Android Marshmallow 6.0.1, Whereas there's no word on updates yet. The UI looked clean and polished having the same amount of bloatware, So don't get me wrong. There are plenty of customizations available within the stock launcher all the way up to Themes, Icon Packs, Wallpapers, Animations, etc. A solid swipe down from the Home screen gets you into the search mode which helps in searching everything from the device. Then there's ZenMotion, which helps in setting up different gestures for your device for launching specific apps, Same as what we've seen with previous zenfones. 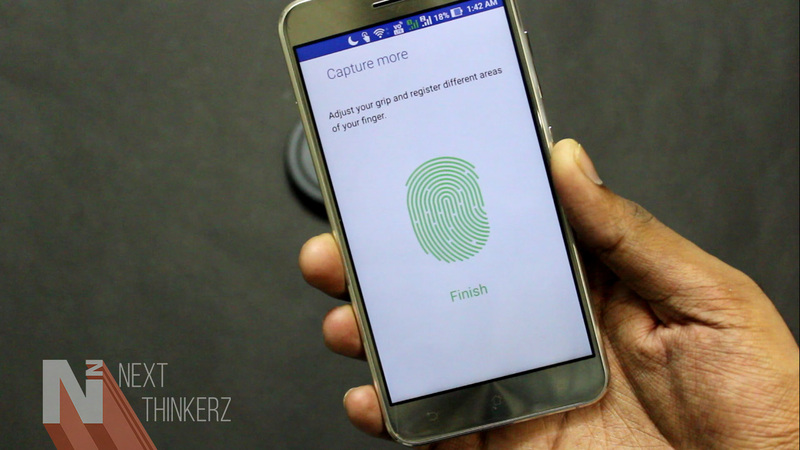 But Fingerprint Scanner as an addition can be mapped to click photos in the camera app with just a tap. Also while setting up the Zenfone 3, Asus gifts you a 100GB of Google Drive storage for two years straight. While when you first set up the device, You can find the parallax effect going on the home screen with the default wallpaper, Just try to slant your device gently back and forth. Then there's the Mobile Manager app, A nifty little feature which can be annoying at times. This app has been integrated with the Core UI, and it helps in keeping the RAM free, Providing specific apps permissions to manage certain tasks. So it is always running in the background, and it helps in keeping your device in a smooth manner, Not sure how much it affects the battery, though. At times I felt this annoying because, When I clear each and every notification from the notification shade, The toggle of Mobile Manager always stays in the same place. There's no way to disable it individually, The only way you can disable it is by turning the entire app down, Which, in my opinion, won't be a good idea. Similar to Mobile Manager, there's Game Genie. Game genie could be described as a plugin which gets inserted in every app, and it helps you connect with the gamers and find game tutorials in a popup without even leaving a gameplay. When it comes to Battery Life, The 2650 mAh battery lasted me for approximately 4-5 hrs on heavy usage which included Youtubing, Enjoying Audio Tracks, Gaming, Writing, Decent amount of 4G Usage and been connected to WiFi most of the time. Whereas on my regular usage, it lasted me for about 9-10 hrs max. But unless and until you have the Asus's Quick charger you don't need to worry about losing enough juice. It initially takes less than an hour to charge completely without being used. All of this is possible due to the USB Type-C and Qualcomm's Quick Charge 3.0 technology. I wished that it had a better battery regarding numbers. So speaking about that Hybrid SIM Slot, You get a choice to either insert 2 Nano SIM Cards OR a Single Nano SIM card with Memory Card. So you're bounded by choice, Choice that has created sacrifices regarding storage wars. Haha, Just kidding. The 32GB Internal Storage works for me, and I've no issues using 2 SIM's neglecting the external storage as long as I have got an active internet connection. Speaking about the connection, Both SIM Slots are 4G enabled and support VoLTE. The speeds observed were quite satisfying and network connection was reliable on my end. Call quality was also good, Especially when I followed it on fewer signals. Asus Zenfone 3 ZE520KL Review: Final Conclusion. Zenfone 3 is a series created by Asus which got the much-awaited design overhaul, Since the origin of Zenfone series. Initially, this Zenfone Tag was termed to stand out in the affordable mid-range segment space in Indian Market. But like every other brand, Asus jumped on the bandwagon to provide "Premium" Tagged Smartphones that cost some extra bucks. If you consider the upgrade made from earlier Zenfone series to the current Zenfone 3, I'll say the pricing is quite worth it considering the Design, Performance & Build. But it isn't worth when it comes to battery backup and slipperiness as the chance of damaging your device is high. Then again, Many of us would also point out about the slightly less powered processor. Don't get me wrong; It has excellent optics at the current price, A Good Design and it stands out from the chinese competition revolving around the word "Quality." Remember, Actually using the device is one thing, While Judging the device upon its price without even using it is another thing. I feel that Asus has done a commendable job upgrading their Zenfone Series and at least the unit I received shouts that out loudly. Though if you think this device is overpriced, Your Preferred choice would be Oneplus 3 depending upon the Internet's Recommendation. That being said, It's high time we understand, Chinese brands are entering India with their Affordable thoughts and Then thinking of competing with the top tier brands. Now, What do you say? Is the Quality or the Price Tag that matters you, while considering to buy any Gadget? Let me know in the comments below. I feel that if Asus had incorporated a bigger battery & a Matte back panel, this would've been my next phone. 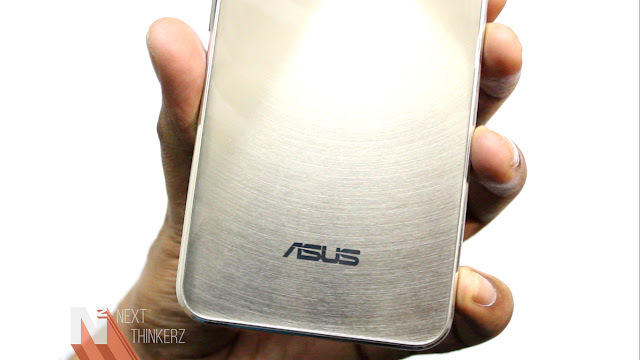 Also See: Refreshed Asus Zenfone Max Review.